When you run, debug, or test your code, Android Studio uses a run/debug configuration to determine how to perform the operation. Typically, the default configuration is sufficient and you can simply run or debug your app. However, you can modify and create new configurations, and modify the default templates, to suit your development process. When you first create a project, Android Studio creates a default run/debug configuration for the main activity based on the Android App template. To run or debug your project, you must always have at least one run/debug configuration defined. For this reason, we recommend that you don’t delete this configuration. Run/debug configurations and template changes apply to the current project only. If you choose to share a run/debug configuration and then check your project into a version control system, the configuration is shared with anyone who checks out the project. You can’t share templates. Select Edit Configurations from the Select Run/Debug Configuration drop-down list in the toolbar. If the toolbar isn’t currently displayed, select View > Toolbar to display it. The Run/Debug Configurations dialog appears, as shown in Figure 1. Figure 1. The Run/Debug Configurations dialog. In the left panel, the dialog displays default templates in the Defaults folder. It groups your defined configurations by template type. You can resize the dialog to see any items that are hidden. In the Run/Debug Configurations dialog, you can start a new configuration directly from a template, or from a copy of another configuration. You can then change the field values as needed. Alternatively, you can right-click an item in the Project window to automatically create a configuration specific to that item. For example, if you want to run a particular activity, you can right-click the activity Java file and select Run. Depending on the item, Android Studio uses an Android App, Android Tests, or JUnit default template to create the configuration. When you create a configuration outside of the Run/Debug Configurations dialog, the configuration is temporary unless you save it. By default, you can have up to five temporary configurations in the project before Android Studio starts to remove them. To change this default, in the Run/Debug Configurations dialog, click the Defaults folder and type a value in the Temporary Configurations Limit field. For more information on temporary configurations, see Creating and Saving Temporary Run/Debug Configurations. You can share a run/debug configuration (but not a template) through your version control system. If you select Shared in your run/debug configuration and then check your project into a version control system, anyone who checks out the project receives the configuration. Activity Java file - Android App template. Package - Android Tests or JUnit template, depending on your source set. If you select an instrumented test, then it uses the Android Tests template. If you select a local unit test, then it uses the JUnit template. For a local unit test, you can optionally run with code coverage. For more information, see Code Coverage. Note: For a build.gradle or settings.gradle file, Android Studio uses the Groovy template. Instead, you should use the Gradle Console to run or debug a build.gradle file. In the Project window, right-click an item and choose Run or Debug. 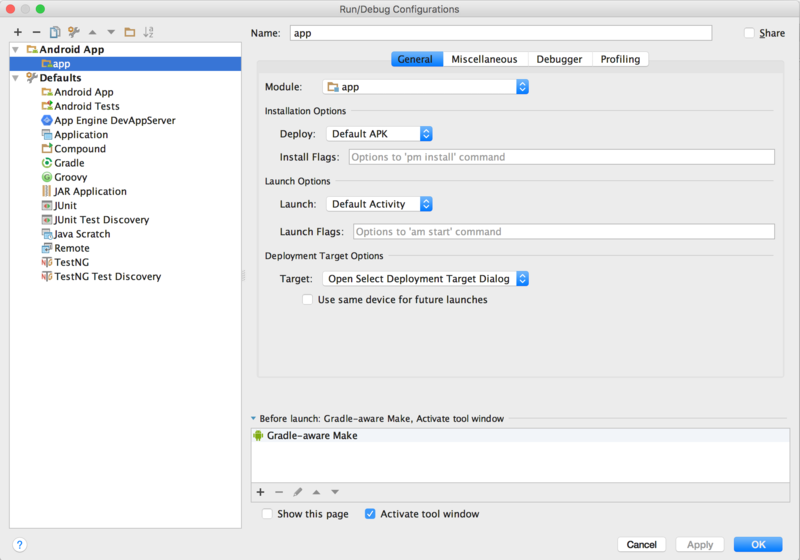 Android Studio creates a temporary run/debug configuration and launches your app. To save the configuration, select Save from the Select Run/Debug Configuration drop-down list in the toolbar. Alternatively, right-click the item again and select Save. Or, select the configuration in the Run/Debug Configurations dialog and click Save Configuration on the upper left. Except for an activity, if you right-click and then run or debug the same item again, Android Studio creates a new configuration. Android Studio uses the Android Tests or JUnit template, depending on your source set. For a local unit test, you can optionally run with code coverage. Select a class or method in the code, and then press Ctrl+Shift+T (⌘⇧T). In the Create Test dialog, optionally change the field values, and then click OK. In the Choose Destination Directory dialog, select androidTest to create an instrumented test or test to create a local unit test. Click OK. In the Code Editor, right-click a class definition in the test file and select Run or Debug to test all methods in the class. In the Code Editor, right-click a method name in the test file and select Run or Debug to test just that method. In the Code Editor, click Play in the left margin next to a class or method and select Run or Debug. To save the configuration, select Save from the Select Run/Debug Configuration drop-down list within the toolbar. Note: During an Instant Run session, selecting a different run/debug configuration, and then clicking Run or Debug again, ends the current session. In the Run/Debug Configurations dialog, you can order your configurations to be able to find them quickly. You can sort the items in the folder alphabetically, and create new folders to group configurations. Select a folder containing configurations. Drag items in the same template category into the folder. Order the folders and configurations in the same template category by dragging them into position or using Move Up and Move Down . You can specify tasks to execute before applying the run/debug configuration. The tasks are performed in the order they appear in the list. Defining before launch tasks is an advanced feature. Instead of using this feature, we recommend that you put any preparation logic as tasks in your build.gradle file so they’ll be executed when building from the command line. To add a task to the list, click Add and select a task type. If a dialog opens, fill in the fields and click OK. Select Active tool window if you want the Run or Debug tool window to be activated automatically when you run or debug your app. App Engine Gradle builder The App Engine Gradle builder task syncs the project and then does a build of the module. Note: Android Studio 2.1.x and lower had a Native Application template, which newer versions don't have. If you have a Native Application template in a project, Android Studio automatically converts it to Android App when you load the project. A Convert Project dialog guides you through the process. Follow the links to the IntelliJ IDEA documentation for details on using these templates. A run/debug configuration has the Name and Share options, while the template doesn’t. Name The name of the run/debug configuration. Select this option to make the run/debug configuration available to other team members through version control. You can share a run/debug configuration, but not a template. If you select this option, when the project is checked into Git (or another version control system), the run/debug configuration is included when someone checks out the project. Android Studio stores the shared run/debug configuration in an individual XML file in the .idea/runConfigurations folder; otherwise, it stores the configuration in the .idea/workspace.xml file. For more information, see Directory-based Project Format. Default APK (default) - Create an APK as specified in your build configuration. Nothing - Don’t launch anything. If you’ve specified Nothing in the Deploy field, your app is already running, and you select Debug, this option is similar to using Attach debugger to Android process; selecting Run does nothing. Specified Activity - Launch a particular app activity in your module. Type the name, or click … to select an activity from a list. URL - Specify a URL to launch. See Testing a URL. Open Select Deployment Target Dialog (default) - Open the Select Deployment Target dialog to select a virtual or hardware device. Auto (default) - Let Android Studio choose the best debug type for your project. Hybrid - Debug Java and native code in two separate debug sessions. The Auto option is recommended because it automatically chooses the right debug type for your project. Select this option to debug both C++ and Java Android code within the same LLDB debug session. The Java-aware C++ debugger is an extension of the Native debugger mode; along with C++ debugging, it supports Java as well. If you selected a Debug type of Auto, Android Studio automatically selects this option if the project meets the requirements. Note that if you have a Java-only project and want to use LLDB to debug it, you can select this option and Native. As of Android Studio 2.2, this feature is experimental. For more information, see Use the Experimental Java-aware C++ Debugger. If you specify a directory high in the tree, it can take longer to search all of the subdirectories. If you add a very specific directory, it takes less time to search. You need to find the right balance between speed and finding the files you need for debugging. For example, if you have a directory that contains subdirectories for different Android Binary Interfaces (ABIs), you can choose to add a directory for a specific ABI or for all ABIs. Although it can take longer to search through the upper-level directory, it’s also more foolproof should you decide to debug on a different device. Specify GPU Debugger profiling options for Android Monitor in the Profiling tab. If enabled, running this run/debug configuration will build, install, and run the app with GPU tracing. Tracing isn't supported when debugging an app. If you debug an app with GPU tracing, you'll receive a message and the debugger launches without tracing. This option is relevant for the GPU Debugger tool. Note that after you enable this checkbox, every time you launch the app it will block and wait for you to attach either the debugger or the GPU Debugger. Select this option to disable OpenGL ES graphics driver support for precompiled shader and program binaries during tracing. This option is relevant for the GPU Debugger tool. Precompiled shaders aren’t supported for replaying traces, and so only shaders compiled at runtime using the glShaderSource function can be used for framebuffer inspection. Apps should always query for precompiled shader support before using the glShaderBinary or glProgramBinary functions, and fall back to runtime compilation if precompiled shaders or programs aren’t supported. The tests template that you should use depends on your source set. The Android Tests template is for an instrumented test. The JUnit template is for a local unit test. If you're using Firebase Test Lab to test on a variety of devices, you can use this template to define your instrumented tests. For more information, see Run Your Tests with Firebase Test Lab. In the General tab, you can specify test location, instrumentation runner, adb shell, and deployment options. All in module (default) - Launch all tests from the selected module. All in package - Launch all tests from the package specified in the Package field. Type the name, or click … to select the package from a dialog. Class - Launch tests of the class specified in the Class field. Type the name, or click … to select the class from a dialog. Method - Launch a test method. In the Class field, specify the class that contains the method. In the Method field, specify the method. Type the name, or click … to select the class or method from a dialog. Specific instrumentation runner (optional) Type the location of the instrumentation runner; click … to use a dialog. The build.gradle file specifies the location of the instrumentation runner; this value overrides it. The default is typically the AndroidJUnitRunner class from the Android Testing Support Library . This run/debug configuration applies to the Google Cloud Platform. For more information, see Adding an App Engine Java Servlet Module and Running, Testing, and Deploying the Backend. When you follow these steps and sync your project to the build.gradle file, Android Studio creates an App Engine DevAppServer configuration for you. If an option includes quotation marks, add a backslash before the quotation mark (").